Many people can relate to the feeling of having too many keys. Although you may actually need all of the keys on your key ring or in your drawer, you typically don’t need all of them all at once. For large households, warehouses, and offices, key organization is necessary. The most optimal way to organize your keys is by installing an easy access key box. Most key boxes include key tags and numbered stickers to assist with organization and allow for easy identification. 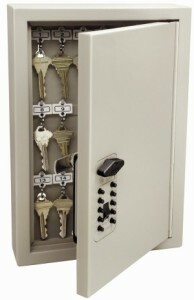 By having a key box, you are able to store all of your keys in one, secure location, allowing authorized personnel access at any time of the day. 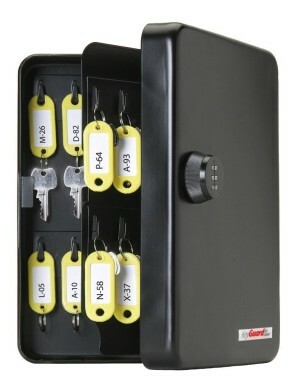 We have comprised a list of popular combination lockbox for keys that can be purchased online for your convenience. All of the products listed in this review have combination locks instead of key locks so that you keep your key count low. This product is ideal for offices or industrial spaces due to its large size; however, this product will work for anyone who has a lot of keys they need to organize. The easy to use combination lock makes it easy for multiple people to access and is great securing keys away from unauthorized personnel and children. Featuring a matte black finish body made out of 16-gauge steel. Besides the neat looking and durable exterior, it also features 48 steel hooks and a continuous hinge. Uses a 3-dial combi-cam lock with up to 1,000 possible combinations. The combination code can be reset, but also be set into a non-resettable mode for increased security. The combi-cam lock is made out of a non-ferrous material making it durable enough to be used outdoor. Includes 24 keys tags of each of the colors blue, red, black and yellow to make organization easier. Including hardware to mount the key lockbox to a wall. Has the capacity to store 48 keys. 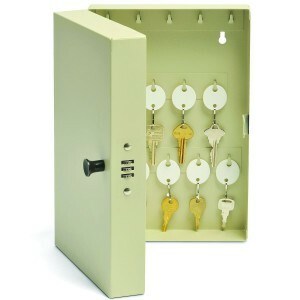 Due to the durability and color of this key box, it is not generally used in private living spaces. However, this product could be perfect for any office, garage, or other industrial places. 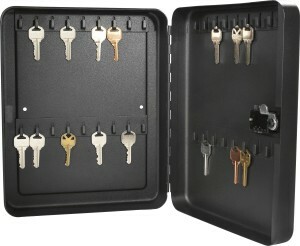 Holding up to 30 keys, this key box would be good to store and organize company vehicle keys or office keys. Durable 16-gauage steel construction with a depth that supports larger key rings. The steel door features a continuous hinge that keep the door in place for many years to come. Features a clutch and push button lock that provides easy and secure access. The user can choose between 1,000 possible combinations and reset the code at any time. Includes all the necessary hardware to easily mount the key lockbox to a wall. Has the capacity to store 30 keys. This product is great for use in personal homes and small offices. It is a medium sized key box and can hold up to 30 keys, making it big enough to efficiently store spare car keys, office keys, and any other keys lying around that need to be organized and secured. Sturdy steel construction that feature a piano hinge that let you open the door completely for a better view over your keys. Combination lock featuring a turn knob and a 3 digit combi-cam with many possible combinations that can be set and reset by the user. To help with organization, there are key tags and numbered stickers included. Mounting hardware provided for an easy installation. Has the capacity to store 36 keys. Due to the lack of many customer reviews, the quality of this product is not very well known. However, based on the manufacturer’s description and the handful of reviews that were available online, this product seems as though it would provide adequate security for keys in a home or small office. Due to the reported malfunctions of the security lock, this product may be only sufficient enough to ward against young children. Durable heavy duty steel construction with a scratch resistant finish. The door features a piano hinge and a sturdy handle that facilitates the opening and closing of the key lockbox. The interior features strong key hooks that allow the user to hang keys with the provided key tags or without, or multiple keys on a key ring. A door mounted combination lock that features a door knob and a 3 number combi-cam. The access code can easily be set and changed by the user. Includes 28 keys tag to help you keep better track of your keys. The pre-drilled holes allow the user to easily anchor the safe to a wall with the provided hardware. Has the capacity to store 28 keys. Stealth Handgun Hanger Safe Review — The Best Handgun Safe in 2017? VAULTEK VT20i Review – Best Biometric Safe in 2017?